A ship lies 6 miles from shore, and opposite a point 10 miles farther along the shore another ship lies 18 miles offshore. A boat from the first ship is to land a passenger and then proceed to the other ship. 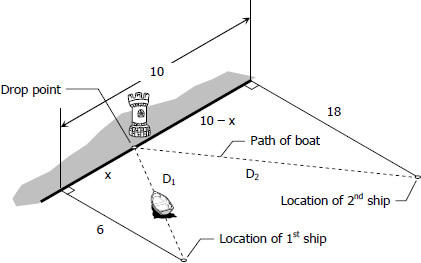 What is the least distance the boat can travel? Two posts, one 8 feet high and the other 12 feet high, stand 15 ft apart. They are to be supported by wires attached to a single stake at ground level. The wires running to the tops of the posts. 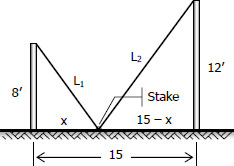 Where should the stake be placed, to use the least amount of wire? A ray of light travels, as in Fig. 39, from A to B via the point P on the mirror CD. Prove that the length (AP + PB) will be a minimum if and only if α = β.